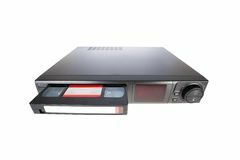 For over 25 years Video Home System (better known as ½” VHS) players provided access to analog video recordings in classrooms. But as technology continued to improve, this format was gradually supplanted by DVD players. What this means at PLU, is that what was once a standard component of classroom podiums, is now obsolete. In May of 2013, Instructional Technologies emailed all faculty to let you know about the sunsetting of the ½” VHS video format. Since the Spring of 2013 we have not been able to purchase new ½” VHS players because they are no longer being manufactured. At this time we have only a few spares left to replace players in the classroom that become inoperable. If you’re still using 1/2″ VHS cassettes in the classroom, please be aware of the following change that will take place this summer and learn what you can do to make this transition as smooth as possible. Remove all remaining ½” VHS/DVD players in classrooms and make them available for faculty checkout as needed. Replace ½” VHS/DVD players with region free DVD players that play NTSC, PAL, and SECAM DVD formats. If you still use ½” VHS videos in your classes, you may check out a VHS player that can be easily patched into a podium or even stationed in a classroom for the semester if used frequently. You can reserve a ½” VCR from Instructional Technologies by emailing itech@plu.edu. Ultimately though, you will need to take action to replace these videotapes or find alternative instructional content. Un-copyrighted ½” VHS tapes may be converted to the DVD format using commercial conversion services. Copyrighted ½” VHS tapes might be available for purchase. Contact your department/school faculty library liaison for assistance in researching options for purchasing videos in DVD format. If you have any questions or concerns about this transition, please contact either of us at itech@plu.edu. Thanks!